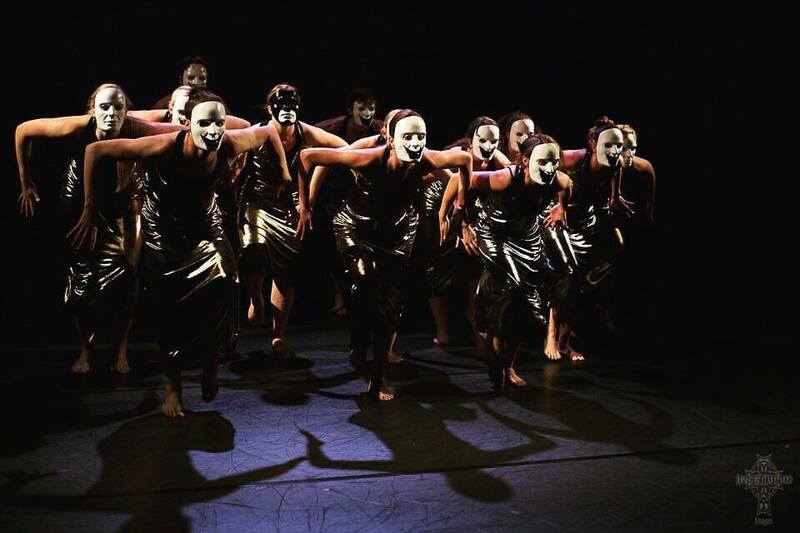 Dancers of Brine in Ashley Creek's "A.D. Part Two: Terra." Photo by Incabulus. Brine’s Disembodied We (presented by Repertory Dance Theatre's Link Series) was performed to a sellout crowd on Friday at the Rose Wagner’s Leona Wagner Black Box, one of my favorite venues. It was lovely to see the theatre filled with an enthusiastic audience. “Take your own interpretations from the works presented and glean your own meanings from what you witness,” exhorted Ashley Creek in the program notes; and so, I will venture to do so. “A.D. Part Two: Terra”, choreographed by Creek, set the evening off to an intriguing start, with two masked faces peeking out from behind black curtains. They parted to reveal a sea of shimmering black-clad bodies and masked faces, and … yet another black curtain. That too parted. The dancers moved and drummed insistently on the floor, as they rolled, pulled and pushed, leapt and gesticulated. As a lone, unmasked dancer gestured repeatedly in the foreground, the masked crowd seemed to be both menacing and supportive in turns. It simultaneously evoked the facades we wear to smooth our daily social interactions and, at the same time, there was a hint of the aggression with impunity empowered by anonymity of the mask, as on internet message boards. When the masked dancers marched up along the aisles to engage the audience in an intense turbulent conversation, it was a powerful moment, if somewhat overwrought. It indicated that this was a sequel to another work, which this viewer has not had the pleasure of watching. As in Greek theatre, the masks with the exaggerated expressions were successful in inducing dread and disquiet that the music and the mostly-dim lighting also amplified. At the very end of the piece, the dancers threw their masks with just a split second in which to reveal themselves and one wondered: was it joy, was it triumph; what did they reveal? As music by Warsaw Village Band rose in plaintive notes, dancers gracefully promenaded across the floor, conjuring an unmistakable imagery of loss, regret, and longing for what lies behind whilst still looking toward the hope of the future: the epitome of every immigrant's journey. A lyrical piece, it also possessed subtle hints at the support structures, or lack thereof, for these communities within unfamiliar mores of the new land -- like safety nets that at once protect and stifle. A sense of the struggle to fit in, and then of eventual assimilation, was echoed by the physical movements of the dancers. The exceptional item of the evening followed: Alicia Trump's “Gaslighting Blatherskites" was nothing short of brilliant, at least for this reviewer. Two dancers performed in perfect synchrony to minimal yet stirring music, with aptly chosen snippets of audio from presidential campaign debates past. Together, these elements rendered a masterful portrayal of sound-byte culture, the lack of nuanced or sustained discussion in debates, and the arguments that consume our current political and social discourse. With unceasing dynamism, pithy messaging, unimpeachably adroit choreography and equally exquisite execution that had me glued to the edge of my seat wanting more, this was one of the stand-out pieces of the concert for me. It would be hard to provide a narrative description of the movement in this chimerical piece; one had to see it to experience it. 'Do you feel safe, I don't feel so safe...' in the voice of our current President Trump -- the words trailed off as the lights went out. Gina Terrell’s “Kwashiorkor” (or, serious malnutrition caused by lack of protein) highlighted the plight of starving children the world over, and juxtaposed images of hunger and need in the background with the soft grace of giving in the foreground. Appearing first in bare leotards, women writhed, angst-ridden, embodying a state of famine; then, the imagery evolved to that of plenty, and perhaps even of waste, as they danced to grain falling from the sky. This conveyed eloquently that it is not an absence of plenty but rather plenty of absence that allows millions to go undernourished. The piece was well-conceived, though the images of starving African children seemed a tad bit overt, and trite. Certainly, it tugged at the heartstrings of my inner maternal persona. I wonder if they could have achieved the same effect with different, more subtle symbolism. After the intermission, “What breaks us” by Sara Pickett explored how emotional bulwarks are erected and broken, and illustrated the effect of conformity, of complacence, and the stimulus needed to perhaps lurch us out of these malingering states into one of active response. The bare minimum soundscape for the choreography was intriguing and novel. The idea was well-envisaged, but the execution felt a little less energetic than one might have hoped for. Symmer Andrew’s “Fragments” began with a video of dancers individually emoting to the camera, first in night-time surroundings, followed by a gathering on a grassy lawn. Shortly thereafter the dancers descended onto the stage in the same configuration, accompanied by live music (which was somewhat unsettling: intentionally so, I suspect). I confess, I was somewhat confounded by this piece, unsure of how to interpret it. While there certainly was an element of chaos as indicated by the title, the intent behind it was ambiguous, and eluded an easy elucidation in my mind. The final item of the evening, “Lucy (Part 1)” by LAJAMARTIN, was a high-energy, technically demanding disquisition of the early origins of human civilization. A glimpse of early encounters with wild animals, the fear response, tribal bonding and rivalry, and the seeking of shelter from the elements were all beautifully illustrated in a power-packed performance of muscular, gasp-inducing moves. The dancers prowled, hunted, beat with sticks, leapt into the air, landed low on the ground; it was all incredibly athletic. Every facet that goes into the presentation of performing arts -- audio, lighting, costuming, specials effects (i.e., snow falling and blowing like a blizzard like in this piece) -- along with the sheer grace and vigorous dexterity of the dancers was optimally employed in this intimate theatre setting. It capped off a thoroughly enjoyable evening on a high note. Overall, Disembodied We was a moving, thought-provoking, and entertaining experience to be savoured for this somewhat unschooled viewer of modern dance. It inspires me to bring the same sensibility to the milieu of classical Indian dance forms that I am more familiar with. Kudos to RDT and Brine for a well-produced, wisely curated evening.